This April, the Avengers and the Illuminati face down their final hours. The clock is winding down and the final incursion is upon us. Today, Marvel is proud to present your first look at fan-favorite artist Dustin Weaver’s interlocking covers to AVENGERS #44 and NEW AVENGERS #33 – the cataclysmic final issues! Superstar writer Jonathan Hickman along with blockbuster artists Mike Deodato and Kev Walker bring to a close the epic saga of the Avengers, the Illuminati, and a Marvel Universe on the brink of extinction. 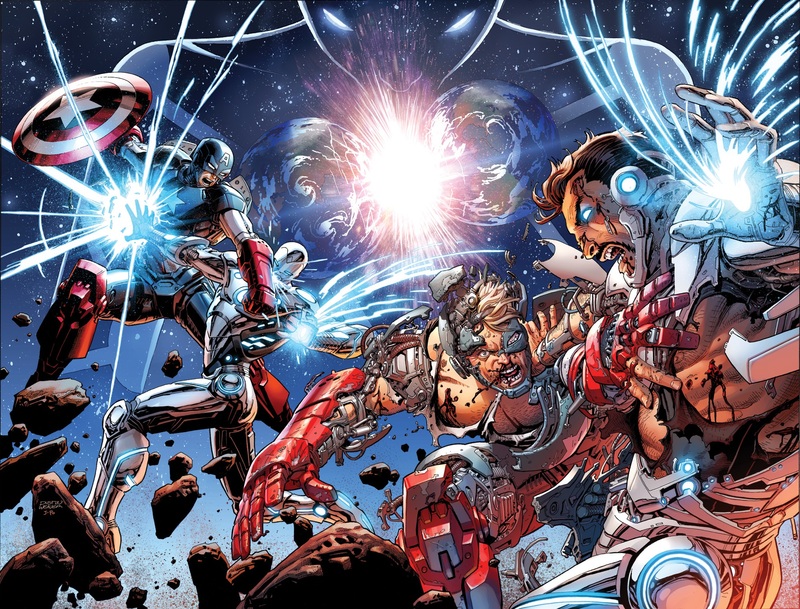 The Incursions from parallel Earths from other dimensions have taken their toll on our heroes, and the battle worn Avengers stand ready to face utter decimation. Before the highly-anticipated SECRET WARS begins in May, close out Jonathan Hickman’s epic Avengers and New Avengers saga with these two, oversized final issues! What changes await Earth’s Mightiest Heroes? Be there when TIME RUNS OUT this April in AVENGERS #44 and NEW AVENGERS #33!